“Do” Think Big When It Comes to Easter Bunnies! Nick was in high school the last time we captured a picture of him with his namesake Nicholas on the Plaza. While Easter is one of the holiest of all holidays, it’s also has been another reason to spoil my nephews and nieces with new clothes, stuffed rabbits, chicks and ducks, chocolate bunnies, jelly beans, yellow Peeps and lots more! It’s always been fun to dye eggs for them (I still do it!) and hide them along with some other surprises around the yard or in the house. 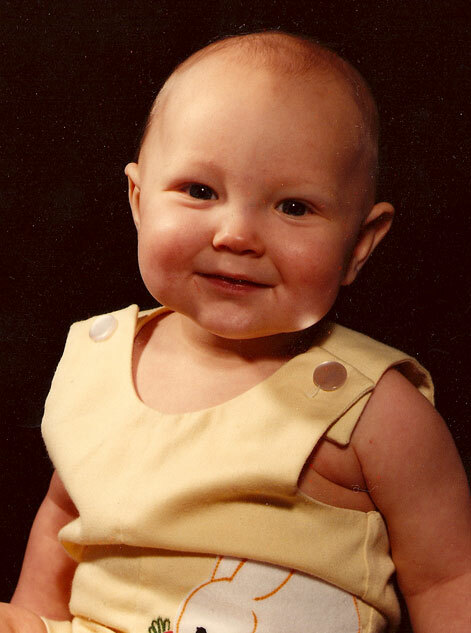 Being the first grandchild and first nephew, Nick hit pay dirt the first Easter that he was mobile (walking!). My mom and sister had found this jumbo sized rabbit in a children’s clothing boutique. The rabbit was quite elegant looking, stood almost 5 ft. tall, had on a dapper vest and had the softest, plushest fur. His name was Pierre Bunny (pronounced with a French twist, “Boo-nee”). He was more than twice the height of Nick, but Nick delighted in trying to carry him which was impossible, so he reverted to dragging poor Pierre around by the arm. Unfortunately, I can’t seem to find a picture of Pierre Bunny, but we all remember the big rabbit well. Now 27, we were delighted when Nick called to get us all together for lunch the Saturday prior to this Easter. 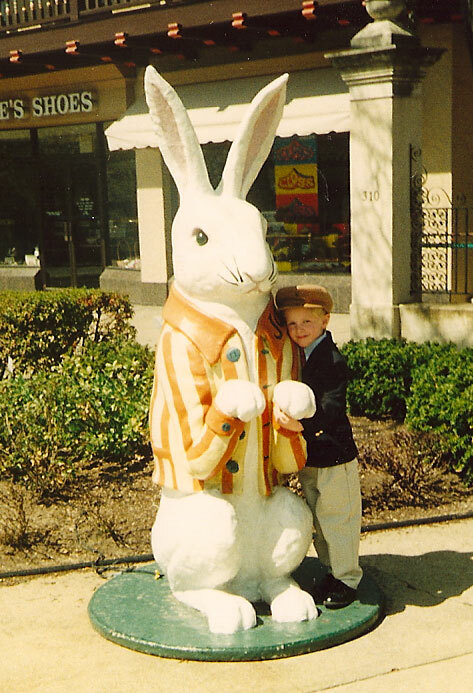 When Nick and Katie were growing up, we would often take them to the Plaza to have lunch on that day and to tour the streets looking for the Plaza Easter bunnies. The Country Club Plaza transforms itself to an Easter Wonderland every year. 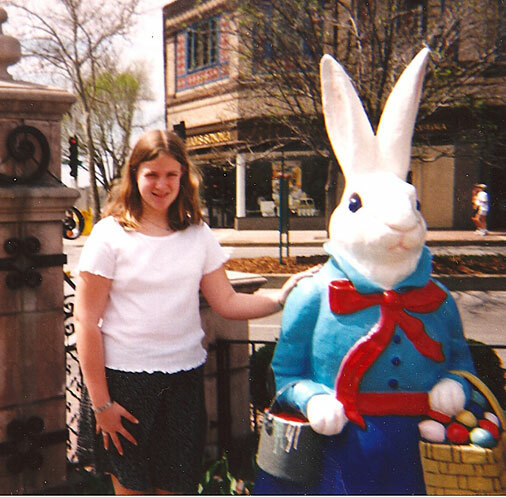 The tradition brings out colorful, larger-than-life bunnies to the Plaza’s courtyards and street corners each spring. They each have names, and of course there’s a Peter, but they also have a rabbit named Nicholas. We would drive around until we spotted Nicholas, the biggest, tallest and coolest of all the Plaza bunnies and Nick’s namesake. We then would park the car and get out so Nick could go stand by him. Nicholas the bunny was usually in the primo location of the beautiful courtyard outside the former, very elegant Swanson’s department store, (it later became a Mark Shale’s, and now it’s XXI Forever), across from the tennis courts on J.C. Nichols Parkway, just down from the J.C. Nichols Fountain. The Giralda Tower is on the corner of the building. 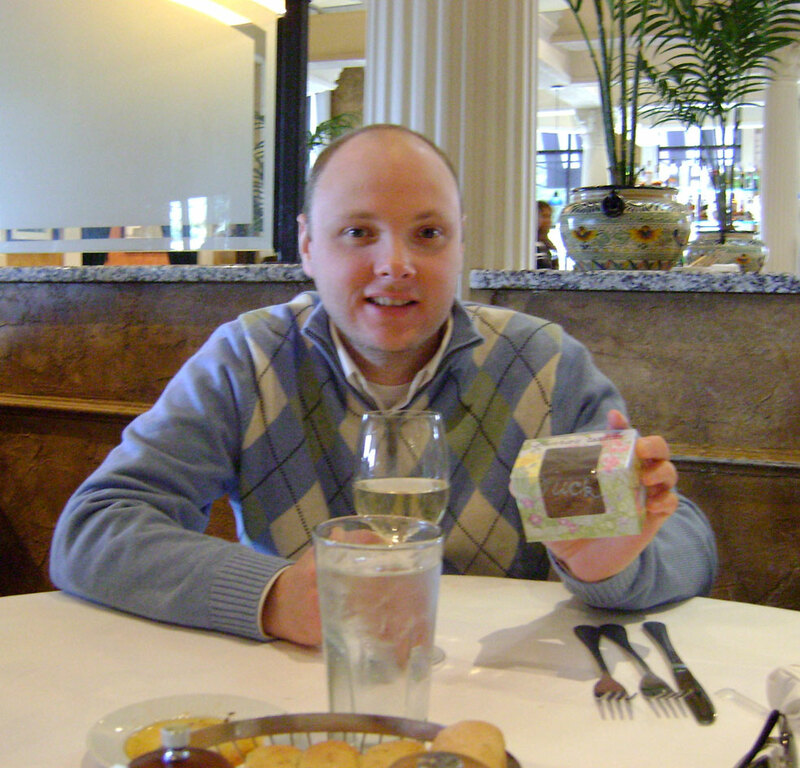 We didn’t make it to the Plaza this Saturday for lunch, but Nick, Katie, my Mom, my sister Debbie and I all had a nice lunch at Town Center Plaza (sort of the Plaza South!). 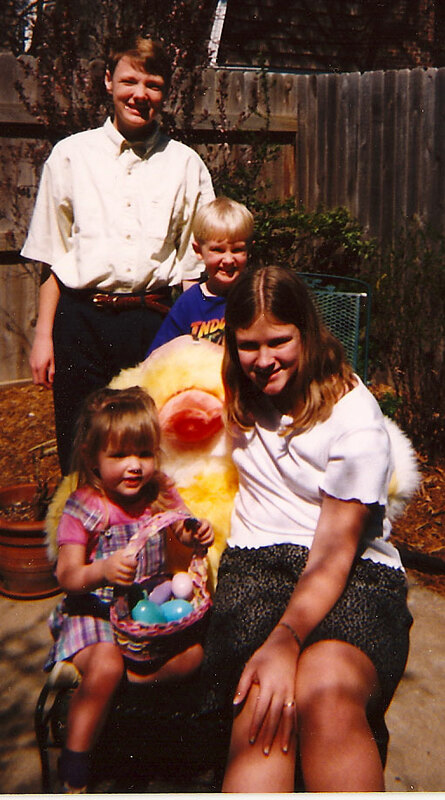 And while Nick and Katie are all grown up and drinking Bellini’s and wine for lunch, we couldn’t help but bring them a big chocolate fudge egg for Easter, something that we would always put in their Easter baskets when they were little. 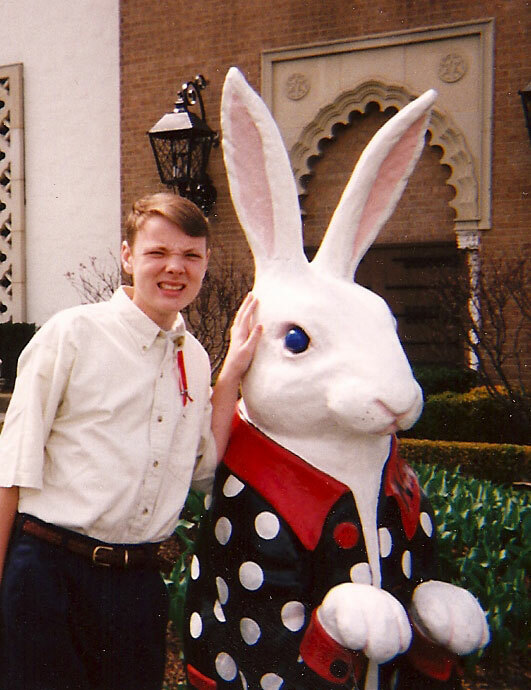 So this Easter, no more big bunnies, no more pictures with Nicholas and the other big Plaza bunnies, but we continue to have a “big” time talking about Easters of the past, and the big chocolate fudge eggs are always good. 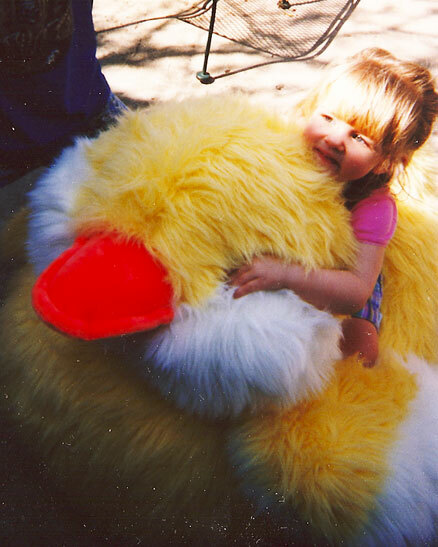 I loved Easters when they were all little, but it’s just as much fun now that they are all grown up. Katie also had a namesake Plaza Bunny called Kate! Ian on the Plaza with another one of the Plaza bunnies.